While searching in InfoKat Discovery, if you find a title you're interested in but it's in Storage or even a different branch, you can request it through Book & Media Express by clicking the Request link near the top of the Availability tab. 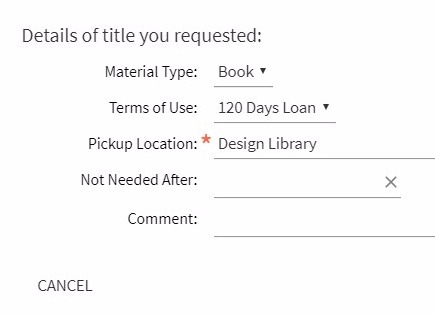 On the form, you can specify the branch of UK Libraries where you'd like the pick up the item, and also an optional date after which you would no longer need it. You will be notified by email when the item arrives (usually within two business days), and you can check it out at the circulation desk. Non-circulating materials, Reference, Journals, Scores, and Special Collections materials are not available through Book & Media Express. If you find a resource in InfoKat Discovery that the library does not have access to, you will have the option to request it through InterLibrary Loan. Click the InterLibrary Loan request link for the campus you are associated with, and fill out the form there to make your request.